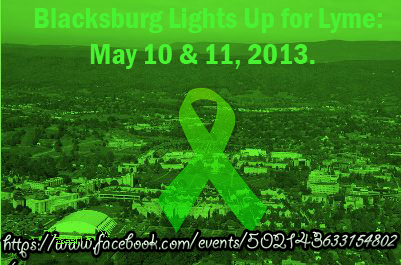 Blacksburg, VA Lights up for Lyme! | What is Lyme Disease? On May 10 from 12-4 at Virginia Tech campus & medical community outreach! On May 11th, we will peacefully march downtown for Lyme Awareness, library, Kent Square, Farmer’s Market, 1st & Main, outdoor hot spots (Huckleberry Trail, Pandapas, Heritage Trail)! 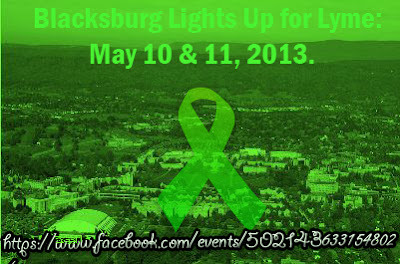 Get your voice on & walk on for LYME Awareness in May! Join our Facebook Planning Page!